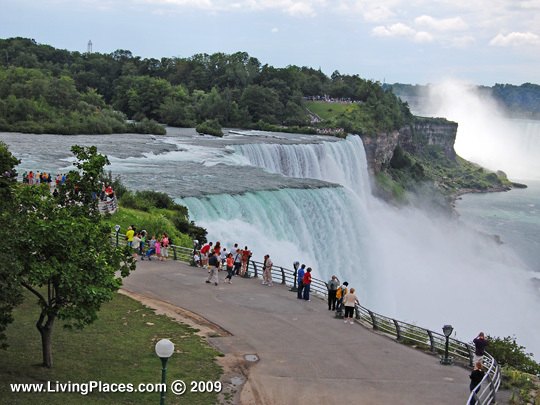 Photo: American Falls, Niagara Falls, NY. Photo by The Gombach Group, © 2009. Niagara County Courthouse is located at 175 Hawley Street, Lockport NY 14094; phone: 716-439-7000. The territory now comprising Niagara county was formerly a part of the great county of Ontario, which was erected in 1789 and included all of the State of New York west of the Phelps and Gorham preemption line. The territory of the original provinces of New York and Massachusetts was chartered to extend westward indefinitely. New York in 1781 and Massachusetts in 1785 relinquished to the general government their claims to territory beyond the western boundaries of this State, but Massachusetts still claimed that part of New York west of the meridian line extending along the eastern line of the present Ontario County. Against this presumptuous claim New York contended, but the dispute was settled in 1786 by New York retaining the sovereignty of the territory, while the ownership, subject to the Indian title, should remain with Massachusetts; that is, the Indians could convey title only to Massachusetts. The eastern boundary of the Massachusetts claim became known as the Pre-emption Line, as that State had the right of pre-emption, or first purchase, of the territory in question. New York, however, retained a strip one mile wide along the Niagara River. In 1788 Massachusetts sold to Oliver Phelps and Nathaniel Gorham, and their associates, the pre-emption right to Western New York for $1,000,000. To acquire the Indian title a council was held in Buffalo in July, 1788, at which for $5,000 down and an annuity of $500 the company bought about 2,600,000 acres, bounded on the east by the pre-emption line. The tract thus secured is known as the Phelps and Gorham purchase. In March, 1791, Robert Morris contracted with Massachusetts for the pre-emption right to all of New York west of the Phelps and Gorham purchase; the Indian title to this was acquired in 1797, excepting eleven reservations, two of which were the Tuscarora reservation (then about one mile square), and the Tonawanda reservation, both in what is now Niagara county. Morris sold his lands in immense tracts, with only one of which are we here concerned. On December 24, 1792, he sold to Herman Leroy and John Linklaen 1,500,000 acres west of the east transit line. On February 27 following he sold to the same persons and Gerrit Boon 1,000,000 acres. July 20, 1793, he sold these three persons 800,000 acres, and to Herman Leroy, William Bayard and Matthew Clarkson 300,000 acres. These vast purchases were made for what is known as the Holland Land Company, or the Holland Company (though no such company ever existed), and the tract as the Holland Purchase. It included what is now Niagara county. On the 11th of March, 1808, Niagara county was erected from Genesee. Its eastern line has remained unchanged, except that it extended southward to Cattaraugus Creek, which is the southern boundary of the present Erie county. Niagara county at its formation included what is now Erie county, the latter being set off on April 2, 1821. The boundaries of Niagara county have not since been changed. By the census of 1820 the population of the whole of Niagara county was 23,313, of which number 15,668 were in the Erie county territory. The original town of Willink, erected in 1804 in what was then Genesee county, comprised a tract of land eighteen miles wide and perhaps a hundred long, including all of Niagara county territory. When the latter county was erected its entire territory was constituted one town Cambria.